This is my 100th post I have just become a Guru on Blotanical, all it took was lots of pleasure in looking at so many wonderful garden blogs around the World. Many thanks to Stuart at Blotanical for providing this opportunity. I decided for this post to do a Meme. I have been tagged by Missy M of Missy Wayne's Backyard, Happy Mouffetard of The Inelegant Gardener, VP from Veg Plotting, Maureen from Allotment Heaven and Bangchick of My Little Vegetable Garden during the last few months and just haven't got round to taking up their tags so here goes. Seven things about me, it was fun looking through photo albums for old photos. 1. 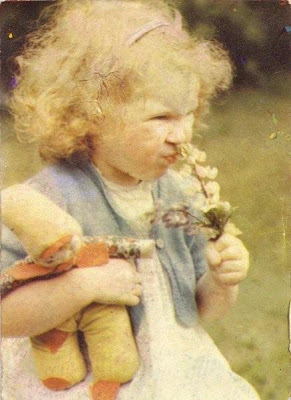 The above photo of me as a child must be where my love of gardening was born. My maternal Grandfather was a photographer for the local paper in his spare time. This was his early attempts with colour photography in about 1953. 2. 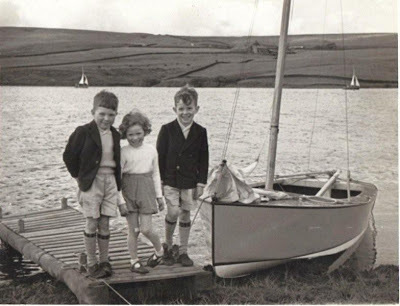 Here I am with my two elder brothers at Bolton Sailing club where my parents spent most Sundays racing, while we ran wild in the woods. As children we didn't get much opportunity to actually sail but in my early 20's whilst living in Torquay I joined a sailing club. I went with some friends in a yacht and entered the Tobermorray Race from the Clyde a three day race to the Isle of Arran and also with a group from work we hired a yacht and sailed from Teignmouth across to Aldernay, Guernsey and then back into Dartmouth both were memorable trips. 3. 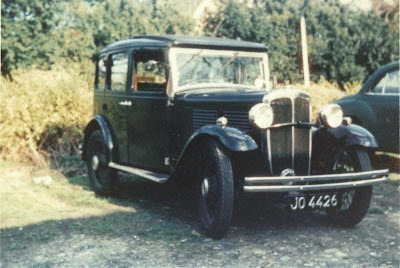 This Standard Little Nine dated 1932 was my first car it was such fun to drive around Wimbledon where I was working in the 1970's. 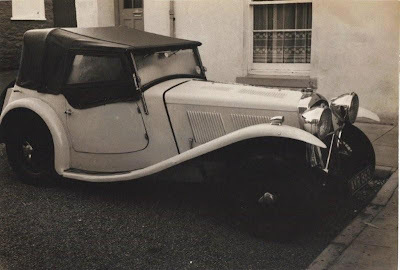 My first husband was keen on old cars and this Wolseley Hornet, Eustace Watkins Special 1935 was stripped completely and rebuilt by him with dogsbody getting the menial jobs. Although I dismantled the upholstery and re upholstered the interior. Quite a good job if I might say myself. 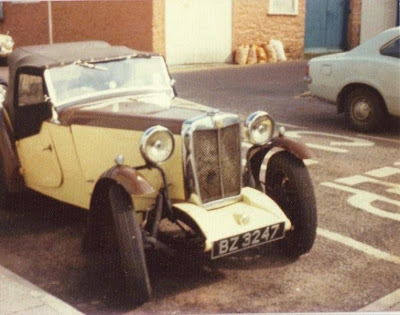 Eventually I also had a stab at the tonneau and hood which were particularly challenging without old ones to take a pattern from. 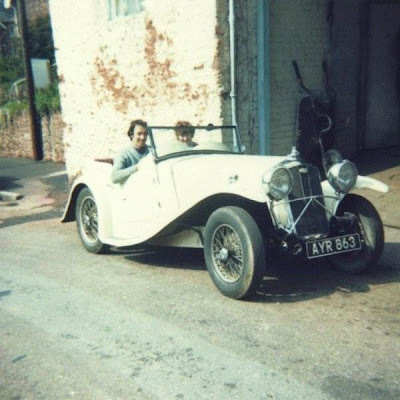 This MG PA 1934 was my last car I had whilst married to my first husband sadly after we split up it was not practical for me to hang onto the lovely car. 3. Some years later I met and married Mike and have been so lucky to be married to such a lovely man. These are our two daughters now grown up and nearly 30, where have all those years gone. I am not allowed to put family photos on my blog but hope they don't mind me using this one. They are both lovely girls and I am proud of them. Both have continued in their individual ways with my love of gardening as seen in an earlier post Nature or Nurture. 4. 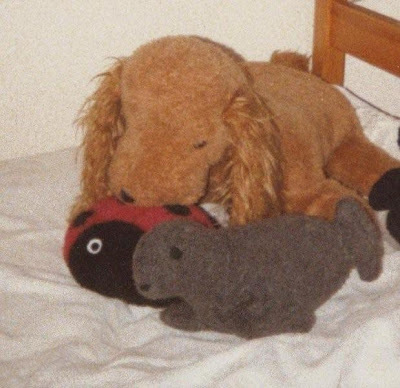 Being a none working mum with time and shortage of money I started to make soft toys, although it didn't provide me with an income because selling is not me, it was fun and provided presents and raffle prizes for schools and charities. 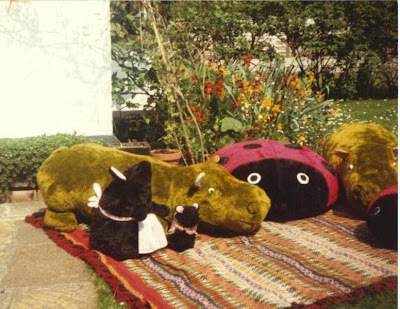 These Hippos were so the children could sit astride, my favourite toys were lions large enough to sit on and I am sorry I never took a photo of them. 5. 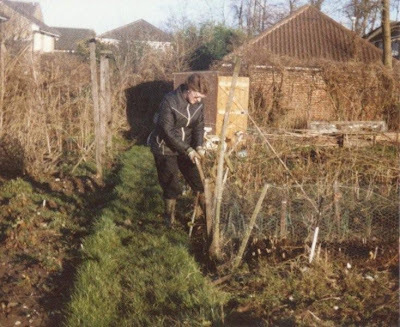 When the children started school I took on an allotment but when I returned to work part time it was easier to grow vegetables in the garden and give up the allotment. A much younger and thinner me without the grey hair. 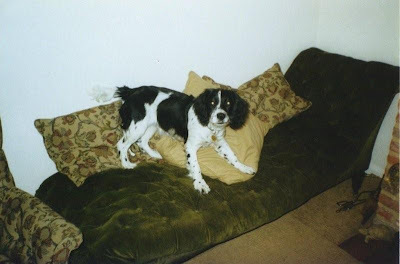 My success with the car upholstery led me to try my hand at furniture re upholstery and this is a chair I recovered, with Beth as a puppy misbehaving as only Springer Spaniels know how. Another of my projects was this Victorian Day bed. not an easy task it had 94 buttons to sew in. A lot of thought has gone into who to pass the meme onto so I do hope you pop over and look at their blogs. There are so many I could have chosen not just the many on my blog roll but so many more on Blotanical. Firstly I nominate Kiki Awake with Charm and Spirit because I found her photography outstanding and her poems/prose lovely. I found a kindred spirit in her love of trees. Secondly I nominate Rob of Our French Garden in the beautiful Dordogne because I love following his garden. Thirdly I nominate Rosthchild Orchid Wisteria and Cow Parsley I am so enjoying her blog and look forward to seeing her develop her rambling and overgrown small holding. Her words not mine. Fourthly Charlotte of The Galloping Gardener which I love to follow but because of her work in India with The Raven Foundation. Esther of Esther's Boring Garden blog recently did a meme and chose blogs that were not gardening blogs so thanks to her for her idea which I will copy and have therefore chosen. Fifthly Renee of Renee's Reflections Her and her husband struggle with chronic ill health because of Lyme Disease and the medical system. Sixthly Laurel from Dreams at Stake for her courage at fighting her many chronic health problems including Lyme and ME/CFS. Her efforts recently in producing a video testimony are to be commended and I hope you take time to watch her video. Last but not least number seven I choose Jo of Jo Blogs struggling with ME/CFS lets hope the recent news over XMRV retrovirus helps so many such chronically ill people. This last one is not a tag because I do not think it quite appropriate but I would like you to pause and look at Lewis Jeynes struggles over the last nearly four years. 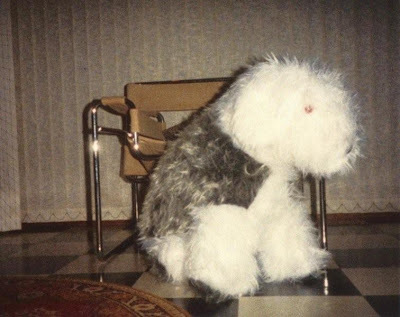 He has finally been diagnosed with a cause for his deteriorating chronic ill health, Lyme Disease and is being treated privately on oral antibiotics he is improving and has gained some control of his head . Still the NHS shake their heads and will not treat him on the stronger antibiotics he needs because they follow the IDSA discredited Guidelines. Next time you meet someone who dismisses Lyme and/or ME/CFS as rare and easy to cure please remember that for many of us that is not the case. Congratulations on your latest achievements! Your blog is gorgeous as ever! I am very impressed with your Meme and I especially love the ladybirds you made! I would most certainly buy one of those. I bet your kids loved them. May the blog continue to inspire for many years to come! Ryan Many thanks for your encouraging words. Joanne... One of the few bloggers that had played really important role in connecting people within the circle of Blotanical. You are great! 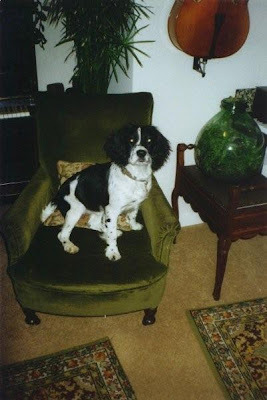 What a super beautiful and decadant post Joanne!Such beautiful images from the past..all those stunning old cars..family photos.gorgeous puppy...my gosh..gorgeous!You are a wonderful writer and creative spirit in so many ways! Loved hearing about your life! I am super touched you mention me..and my heart is appreciative of your generous and kind nature..you are an amazing kindred, thanks for everything! I also say thankyou for the other links you have highlighted and I look forward to checking out all thier blogs!Thanks for spreading your magic everywhere! Bless your sparkling heart! I love finding out about my fellow bloggers. The photo of you at the top is gorgeous and I can see the family resemblance in your daughter's photo too. Those cars are fantastic, they look like so much fun. Bangchick many thanks for your kind words. Kiki I am touched by your words. Wow, you are so talented! I'm honoured to be tagged and never refuse an opportunity to talk about myself. Hmmmmm . . . Many congratulations on your 100 posts/achieving guru status Joanne from a mere master :) Love the first photo - it looks like an old Pears soap advert without the bubbles. Long may your blog continue to bloom as it gives a lot of us much pleasure. Congratulations oh great guru! I bow to your wisdom. And 100 posts, that is quite an accomplishment. That first photo of you is magical. I wish you would keep it in your header or sidebar for us? So kind, generous and thoughtful, and it all shines through in today's installment! So glad to have you as a friend! What can I say so many lovely comments thank you I do hope you find time to check out all the links. Congrats on you 100th post, I love reading your blog! I always enjoy my visits here.I love seeing what is going on in your garden. That photo of you as a young girl is priceless.I love the photo of your girls too. Joanne, I'm so glad you did this meme. You are such an interesting person! It was clear from your blog, but now we know more about you. The first photo - I thought it was a painting. Charming, lovely, funny! The picture of you with your brothers is a pure classic! Your daughters' picture is priceless, it reminded me of my sister and me when we were this age. All in all, it's a great post, thank you! Congratulations with your 100th post and Guru! Love your garden and your blog. a sure cure for my 'Anglophile' urges. It's been far too long since my last forays in the English countryside. Joanne, I just love the photos of you as a child - both alone and together with your brothers. So sweet! Must check oout your recommendations. Those cars are cool and you are amazing with your upholstery skills. Congratulations on reaching Guru, and on 100 posts. This is a very memorable post to be the 100th. You have so much talent. I enjoy sewing but have always been a little intimidated by slipcovers and upholstery. Your work is beautiful. I really enjoyed the old photos. The cars are awesome, and what beautiful children you, and your own little ones were! What a moving post. So much in it and so very varied. And what an interesting life you have led so far. More fun to come I hope. Boats, cars, what next? Aeroplanes? That top picture your granddad took is unbelievably lovely. Makes me want to see more of his work. I am so glad I happened by. Congratulations on your hundredth post - that's quite an achievement and well worth celebrating. What a great 100th post, Joanne. great photos and stories. Here's to the next 100! Joanne, Congratulations on your 100th post and reaching guru status! I bow to you too. Thanks to this well written meme, I got a chance to get to know you better. I love the curly hair because it just made you look like Shirley Temple, especially in the 2nd photo. 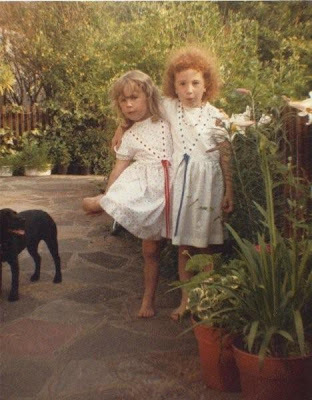 The first photo convinced me that you truly love nature and the garden since a very young age. Joanne, I would love the first picture to grace your book if you ever decide to write one. Thanks for the tag. I don't know when I'll get around to it. Story of my life! I love the pictures of the toys you made, they look so cuddly! How lovely it was to hear that you now own the Wolsey Hornet and looking at the great photos she is a credit to you.